This is what Thanksgiving is all about – giving THANKS for all of your blessings. Don’t forget to say THANK YOU when the gravy is passed! You can also see this sign in the WonderGrove Kids Use Polite Words animated lesson. In 1620, the Pilgrim SHIP called the Mayflower made the historic voyage from England to the New World. The Mayflower brought about 150 people to North America – 102 passengers from Holland and London plus the SHIP’s officers and crew. The first Thanksgiving was a feast in 1621 at Plymouth Colony between the PILGRAMS and the Wampanoag, a Native American tribe. The PILGRAMS left England seeking religious freedom and were early settlers of the North American colony called Plymouth Colony (present-day Plymouth, Massachusetts). In addition to turkey, the first Thanksgiving feast included waterfowl, venison, fish, lobster, clams, berries, fruit, squash, and PUMPKIN. Many of these foods, with the exception of the seafood, have become a part of the traditional Thanksgiving meal. Many people include PUMPKIN in their Thanksgiving meal by making PUMPKIN pie. Although not one of the foods included in the first Thanksgiving feast, NUTS have become a popular snack during Thanksgiving time and PECAN pie is a favorite Thanksgiving dessert for many. The sign for NUT can be used for all types of NUTS. To be even more specific, use the sign for NUT and then fingerspell the name of the NUT you are talking about. Rather your favorite is apple, pecan, pumpkin, or sweet potato, make sure you know how to ask for more PIE! Talking about all this food is making me HUNGRY! The same sign can be used for HUNGRY and APPETITE. Bring your APPETITE to Thanksgiving dinner and surely you will not leave HUNGRY. You can also see this sign in the WonderGrove Kids Use Polite Words animation. Thanksgiving is extra special when spent with FAMILY and friends. Our FAMILY and friends are an important part of what we are thankful for. Giving thanks is all about APPRECIATING what we have, including the people in our lives that make it special. Make sure to show your APPRECIATION for others and you can also use this sign to say PLEASE. You can also see this sign in the WonderGrove Kids Use Polite Words animated lesson. It’s hard to pick only ten signs to know for Thanksgiving! There are so many things that people do during Thanksgiving, including EAT, VISIT family, watch FOOTBALL, watch the Thanksgiving Day PARADE, SLEEP, SHOP, and more. Full Members of Signing Savvy can see our Thanksgiving Word List to learn more signs, practice the signs using the flash cards and quizzing features with the pre-built word list, or create your own word list of Thanksgiving signs. As you are giving thanks this Thanksgiving, remember to show your love and appreciation for the special people in your life and be kind and polite to all. Learn about using polite words in this WonderGrove Kids animation featuring sign language from Signing Savvy. Developed by Educators, the Use Polite Words animation has accompanying lesson plans and extension lessons that align to the Common Core Standards for Pre-K through Second Grade. Plus, there are over 100 more animations at WonderGrove Kids. The animations are a fun way to learn and practice sign language vocabulary, while specifically designed to fit well with an Early Childhood Curriculum - they are perfect for daily use in the home or classroom. Find out more about the animations and the WonderGrove Kids program. Full Members of Signing Savvy can see all the signs in this animation in our WonderGrove Kids Animation: Use Polite Words word list. Practice the signs in the animation by using the flash card and quizzing features for the word list on the Signing Savvy website. I know, you never thought you would hear me ("The Man in the Blue Shirt") say that deaf children are signing too much, right? Well I say it only in perspective of comparing their signing skills to their writing skills. I think there are often times in the field of Deaf Education that the parents, teachers and interpreters that are working with the deaf and hard of hearing population are just so excited that the children are beginning to express themselves through sign, that they don’t want to “slow them down” by making them think about putting these concepts they are signing into a written form. It doesn’t help that sign language itself is language that is presented “in the air” and that American Sign Language does not have a written word for word counterpart that goes along nicely with English. This is all the more reason for people working with our deaf and hard of hearing population to take the time to directly teach these skills to our students. The written language is the way they will present themselves to the public through resumes, cover letters, notes and even social media. Like it or not, the skills that you show through your written exchanges with people help them to determine your grasp of the English language and to many, rightfully or not, your intelligence. Anyone who works with the deaf population knows that the link between intelligence and writing ability doesn't always go hand-in-hand, but that is the perception of the general public. There are many ways to help students work on their writing skills. We have discussed a few of them before in previous blogs but I would like to hear more from our friends out there with the practices they are using currently to foster better writing skills amongst their deaf and hard of hearing students. Please post your comments below. Let's see what we can come up with as some innovative and creative ways to help out the population we love to serve. I think writing involves a whole different language than ASL. You are really asking deaf kids to be bilingual. This is not a bad thing. Many children around the world grow up bilingual and it seems to be good for them. But there is no denying it is somewhat more difficult to learn two languages than just one. Learning to write for a kid who thinks in ASL is not the same as learning to write for a kid who thinks in English. Yes, written English is somewhat different than spoken English but the difference is one of dialect, not language. For the ASL speaker it is a difference of langage. ASL has a different sentence structure and treats pronouns in a wildly different way. It seems to me like one of those weird languages one might encounter in a linguistics class that permits complex verb forms with subject and object built in. I know a deaf couple whom I see from time to time. Their emails to me have the feel of what I'm learning to do in ASL. I feel I have to be careful in how I say things when I write to them. That is what has gotten me interested in the difficulties of learning both ASL and English. All this has me thinking that one of my retirement projects might be to translate some English stories into an ASL-ized version. I don't mean using one of the write-ASL-on-paper methods that have been developed. My goal would not be to describe ASL but to write in a hybrid language that speakers of both ASL and English could learn without too much difficulty. Such a hybrid might be used to bring deaf children to English. Or maybe not. One problem with my opinion is that I am still a long way from being fluent in ASL. I also have little concept of what it is like to grow up deaf. Maybe it is better to teach reading and writing English as a foreign language. One that is close enough to ASL that fluency could be obtained in a school setting. Sign language is not a universal language. Unfortunately sign language is NOT universal throughout the world. There is American Sign Language, British Sign Language, Spanish Sign Language, Japanese Sign Language, Ausian (Australian Sign Language) and many more. In fact, there are even multiple sign languages used in the United States (American Sign Language, Signed Exact English, regional dialects, etc.). Although one universal sign language would probably make things easier, just like with spoken language, the world would have a very difficult time trying to come up with whose way of doing it was the best way! 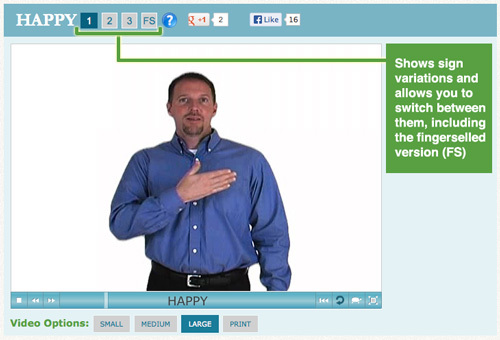 What is the difference between American Sign Language and other sign languages? Sign language has many different facets to it. American Sign Language (ASL) is the language created and used by the Deaf in the United States, Canada, parts of Mexico, and some other parts of the world. ASL has a limited amount of signs, but it is the purest language from the Deaf perspective. If you are using strict ASL and interpreting English, you often fingerspell words for which there are no signs. Being its own language, ASL not only has its own vocabulary, but also its own grammar and syntax that differs from English. Signed Exact English (SEE) and other variations (Manually Coded English, Pidgin, etc…) are also "sign languages" used by some in North America. These languages typically use ASL signs as the base but add a lot more signs to reflect a larger part of the English vocabulary. This is often done using initialization (letter handshapes as you sign) to help clarify a specific word that otherwise might just be fingerspelled or signed with a conceptual similar word in strict ASL. One example would be the sign for CAR. The ASL sign for CAR is two A hands gesturing like they are holding onto and moving a steering wheel. In ASL, this sign is used for any automobile you control with a steering wheel, including a car, truck, bus, van, etc. The English sign for CAR is two C hands, one on top of the other, moving away from each other. If you wanted to specify what type of car, the hand shape is modified to include the initial of the type of vehicle (c for car, v for van, b for bus, j for jeep, etc.). This is where the term "initialized sign" comes from. You clarify the meaning by initializing the sign with the first letter of the intended English word. Therefore, using the English version allows one to specify exactly what is communicated in English. 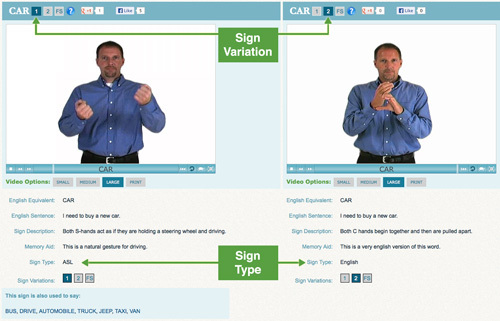 In ASL, you would use the ASL sign for car and if it was important to clarify the type of vehicle, you would follow the sign with a fingerspelling of the vehicle type (JEEP, for example). This is just one example. Many in Deaf culture prefer to sign using strict ASL, using only pure American Sign Language signs. Some have accepted some English signs. However, many English signs are not accepted by those that practice strict ASL, and if you use them in your everyday signing, it could be frowned upon by the Deaf. It is best to watch how others are signing around you and ask if you are in doubt. There are also regional signs that you will see in different parts of North America. This is similar to the concept of regional accents in spoken languages, such as the southern drawl vs. the New York accent. Another example of regional variations in spoken languages is how in the north carbonated, sugary drinks are called "pop" and in the south, it is called "soda" or even just "coke." These same sort of regional accents and variations happen with signing, as well. Using one sign over another is not wrong... just different. Signing Savvy focuses primarily on American Sign Language and signs used in the United States and Canada. Since Signing Savvy is first and foremost a reference for folks signing or learning to sign in North America, it is important for us to also include other signs that you may encounter beyond just ASL signs. For that reason, we also include some commonly used English signs. However, we try to always list the ASL sign as the first sign variation on any given word. We have tried to include known variations of signs, along with how to fingerspell each word. As you communicate through sign with others in your region, you will find out soon enough what is the more accepted or used sign in your area. An example of a word with multiple sign variations is HAPPY. As you can see in the image below, Signing Savvy provides 3 sign variations for the word HAPPY, along with the fingerspelled version. I'm so glad to have found this website. Lots of signs I've been looking for for years. [...] I'm wondering why you say that it's "unfortunate" that sign language is not universal. It is no more unfortunate than the lack of a universal spoken language.